It's been a while since I last posted but all with good reason...there are many things going on behind the scenes! Over the next few weeks I'll be posting quite a bit about it all. 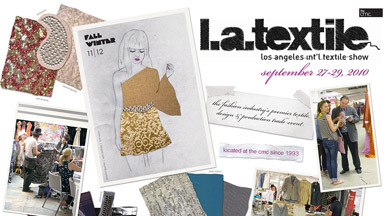 Currently, I've been preparing for the LA Textile Show next week. I'm showing my line with lots of new designs I've been working on...fingers crossed...I'll let you know how it all goes next week. I'll also be posting a full review of the show on HomeWorkshop.com. Wish me Luck!